The objective of the Conference on Energy Efficiency in Cities was to help identify opportunities and obstacles, and understand how to build bridges between national policy-making and local implementation to accelerate and scale-up energy efficiency at the municipal level. Bringing together national and international experts, stakeholders and policy makers from local and national governments, the conference framed the debate around the leveraging of energy efficiency at the national and sub-national levels to support the identification of pathways and actions that increase and improve municipal services for growing urban populations, alleviate financial and fiscal pressures, contribute to cities’ development and competitiveness and help address energy priorities while reducing local and global pollution. Cities account for about twoâthirds of the world’s energy consumption and about 70% of the world’s greenhouse gas emissions. Cities experience continued population growth due to the migration towards large urban centers, as people look for better job opportunities and living conditions. The increased urban population coupled with economic growth will generate an increased demand for municipal services, such as street lighting, transportation, water, or solid waste management. Improving resource and energy efficiency can yield important financial savings and other benefits for cities and the the environment – without compromising the quality of service delivered. Ciudades del país participarán en proyecto para aprovechamiento de la energía. México, Secretaría de Energía (SENER). Press Release 056.2014. June 25, 2014. 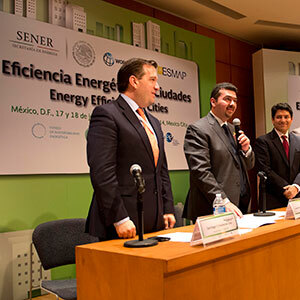 Evaluarán eficiencia energética en México. La Jornada Newspaper, June 18, 2014, p. 37. 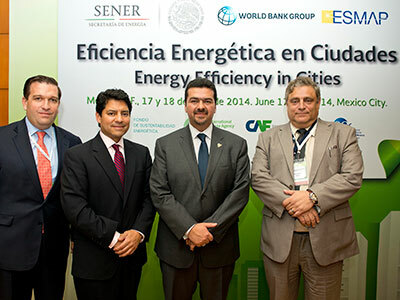 Mexico, World Bank to assess city energy efficiency. Business News América. Online. June 26, 2014. Busca Sener ampliar eficacia en energía. Colegio de Ingenieros Civiles de México, A.C. Online. Banco Mundial apoyará estudios sobre energía en el puerto de Veracruz. El Demócrata. Online. June 29, 2014. Apoyará Banco Mundial estudios sobre energía verde en Cuernavaca. Diario de Morelo. Online. June 30, 2014. SLP participará en en proyecto para aprovechamiento energético. Pulso, Diario de San Luis. Online. June 26, 2014. Busca Banco Mundial opciones de energía sustentable en Cozumel. SIPSE.com. Online. June 26, 2014. Veracruz considerada para llevar acabo programa TRACE. Grupo Formula. Online. June 29, 2014. Van por aprovechamiento sustentable de energía. BizNews. Online. June 30, 2014. 32 ciudades de México participarán en proyecto de aprovechamiento de energía. El Semanario Sin Limites Newspaper. Online. June 26, 2014.